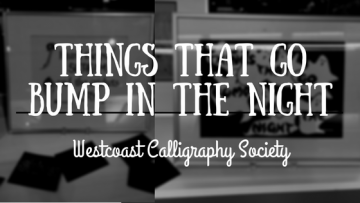 The Westcoast Calligraphy Society’s exhibition “Things That Go Bump in the Night” features a collection of spooky lettering displays that will be at the IKBLC from September 30th to October 27th. 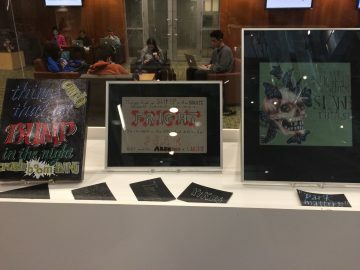 This exhibition theme is part of the society’s meeting about “Words on the Dark Side“. 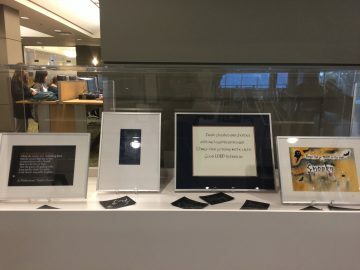 The exhibition shows framed pieces with spooky phrases written in different ways and many other smaller works written in colored pencils against black paper. The Westcoast Calligraphy Society consists of an enthusiastic group of people who continue to share their knowledge of design, color, illustration, bookbinding, paper making and other talents with everyone interested in the art of letters. Many of their members also teach beginning and more advanced calligraphy throughout the Lower Mainland. The society was first established in September 1978 as the Society for Italic Handwriting, B. C. Branch. As it continued to grow and its members’ interests expanded, the focus broadened to all types of calligraphy and in June 1986, the name was changed to Westcoast Calligraphy Society. Some of the society’s previous exhibitions at the IKBLC include “Letters to the Garden“, “The Lyrical World“, and “Snow, Ice and Gold“. Shishkin, Mikhail, Marian Schwartz, Leo Shtutin, Sylvia Maizell, and Mariya Bashkatova. Calligraphy Lesson: The Collected Stories. Dallas: Deep Vellum, 2015. Print.